BJP pulls out of alliance with PDP LIVE UPDATES: Minutes after the announcement was made, Chief Minister Mehbooba Mufti handed her resignation, sources said. The Bharatiya Janata Party pulled out of its alliance with the People’s Democratic Party in Jammu-Kashmir on Tuesday, three years after the two parties came together following a hung verdict in 2014. The decision to end the alliance came on the day J&K BJP ministers arrived in New Delhi to meet party president Amit Shah. Minutes after the announcement was made, Chief Minister Mehbooba Mufti handed her resignation to Governor NN Vohra. Addressing a press conference, the party’s J&K in-charge, Ram Madhav, said it has become untenable for the BJP to continue in this government. “After taking stock of the situation in the state, the central government and central party is of the view that we should leave the government,” he said. On the issue of Ramzan ceasefire, Madhav said it was not reciprocated by separatists or militants. “Keeping national interest in mind and that Kashmir is an integral part of India, we have to say it is time that the reins of power in the state be handed over to the governor,” he said. Meanwhile, National Conference chief Omar Abdullah met Governor N N Vohra and said his party doesn’t have the mandate to form the government. 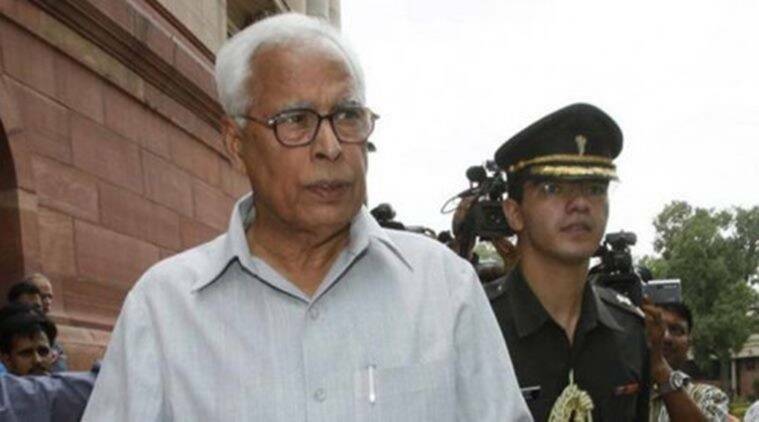 Following the surprising announcement of BJP calling off its alliance with Mehbooba Mufti-led PDP earlier in the day, Jammu and Kashmir Governor NN Vohra has proceeded with the formalities of taking up the state's administration by submitting his report to President Ram Nath Kovind. After concluding his consultations with all the major Political Parties in Jammu and Kashmir, Governor NN Vohra has forwarded his report to the President of India for the imposition of Governor’s Rule under Section 92 of the Constitution of Jammu and Kashmir. Hope that muscular, militaristic policy does not come back under guise of governor's rule in J&K: Congress leader P Chidambaram. "Such coalition should not have happened. These two parties have no similarities. They coming together was an opportunistic move to be in power," CPI(M) General Secretary Sitaram Yechury said. NCP's Nawab Malik said the BJP cannot absolve itself from the prevailing situation in Kashmir. "The party is equally responsible for the conditions prevailing in the border state," he said. Arvind Kejriwal tweets: "3 years later the valley is worse-off from where it stood then"
NSA Ajit Doval & Special Secretary (Internal Security) Rina Mitra leave from Home Minister Rajnath Singh's residence after a high-level meeting. Mehbooba Mufti to shortly address the media in Srinagar. Meeting between Union Home Minister Rajnath Singh, National Security Advisor Ajit Doval, Home Secretary and Joint Secretary of Jammu-Kashmir and other officers is currently underway in New Delhi. As far as I am concerned it is Governor Vohra who will be running the administration. I trust the wisdom of Governor Vohra that he would put the people's interests first: Omar Abdullah. People must be given a chance to elect a government. Decision is up to the Governor whether to seek early election or keep govt suspended: Omar Abdullah. Only BJP can answer the question what compelled them to sever ties. Not shocked by their decision but the timing has taken me by surprise, We have seen the situation deteriorating in the sate... Whether the PDP is embarrassed or not I cannot say. I don't expect the BJP to have taken us into confidence. Least they could have done was taken the PDP into confidence: Omar Abdullah. We don't have the mandate to form the government. No one has approached us and neither are we approaching anyone. I told the Governor we don't have the mandate. He has no choice but to impose Governor rule: Omar Abdullah. The former chief minister has reportedly met with the state's governor N N Vohra and is expected to address the media shortly. By breaking away the alliance in Jammu & Kashmir, BJP can not absolve itself from the responsibilities as a rulling partner in the last 3 and half years. J&K Chief Minister Mehbooba Mufti was in the civil secretariat when the BJP announced their decision to pull out of the state government. National Conference chief Omar Abdullah is on his way to meet Jammu-Kashmir Governor N N Vohra. He will address a press conference at 4 pm. This will be followed by a press conference by the PDP at 5 pm. This came as a shock, but it was not surprising. It was not unexpected. There were certain contentious issues between the two parties...The PDP legislators will discuss the issue at the party meeting at 4 pm: PDP spokesperson Rafi Ahmad Mir. This alliance was anti-national and unnatural. Our party chief had said this alliance won't work out. Had they continued with it they would have had to answer in 2019 Lok Sabha election: Shiv Sena MP Sanjay Raut. When the BJP has formed the government in J&K, we had told the PM that it will be a Himalayan mistake. We have been proven right: Leader of Oppositon in Rajya Sabha Ghulam Nabi Azad. The BJP ministers were summoned a day after the Centre announced it would not extend the Ramzan ceasefire in the Valley. Sources in the party said the meeting was convened following differences between the ruling PDP and BJP over the issue of the ceasefire. Chief Minister Mehbooba Mufti wanted the ceasefire to be extended, while the Centre decided against it in light of the Amarnath Yatra.